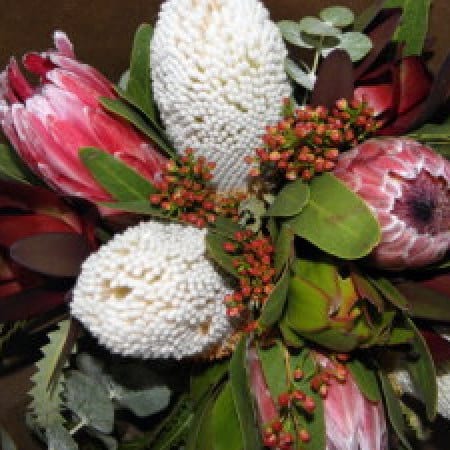 Amaranthine Flowers Protea Highlight Bouquet is full of gorgeous Australian Natives, with the Banksia, Protea, Silvan Reds, Green Leucadenrons, berrys and native gum,wrapped in our fabric gift wrap and delivered in a convenient temporary vase. A long lasting bouquet that will delight from Amaranthine Flowers By Design Charlestown Square, Newcastle. Long lasting and perfect for a thank you, I love you, Happy Birthday, Our Thoughts Are With You, or just because from Amaranthine Flowers By Design Charlestown, Newcastle. Australian Native Bouquets are a beautiful way to give flowers. Same day delivery available to all areas of Newcastle and Lake Macquarie, including John Hunter Hospital, Newcastle Private Hospital, Lake Macquarie Private Hospital, and Mater Hospital. Sunday flower delivery is available.